Are you searching for information on web accessibility? Not sure what you need to do to comply with AODA (Accessibility for Ontarians with Disabilities Act)? Look no more. This website is a hub of information geared to HR managers, business owners and anyone else seeking information on accessible websites. Need a quick overview? We’ve put together a great summary of what you need to know to bring you up to speed on accessibility and the AODA. 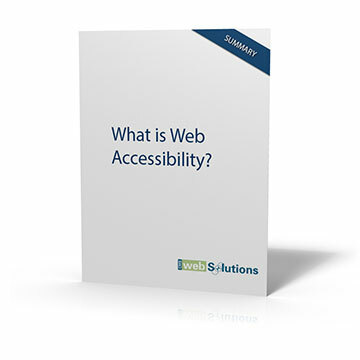 Download our Free Web Accessibility Executive Summary to get started. Why worry about Web Accessibility? Most importantly, a universally accessible and usable website that is open to all visitors is simple just makes sense. Whether you are looking to test or audit your website, fix your current website, gathering web accessibility resources or looking for a firm that provides accessible web development, you’ll find what you’re looking for on this site.